This past Sunday, 60 Minutes repeated an October 2011 program “Apps for Autism.” I have since received a number of calls asking my thoughts on the show. Lesley Stahl interviewed a 27-year-old young man who, prior to the iPad, had pointed to words on a laminated piece of paper to communicate. Now he is spontaneously using his iPad as his “voice.” As I discussed in an earlier blog, we have found that the iPad can be an important tool to develop our students’ communication skills. However, there is no single app that works best for all children. We initially purchased Proloquo2go only to find that this app did not meet the needs of most of our students. I would suggest that you work closely with a speech therapist or someone who knows the communication needs of your child as you try out the many apps that facilitate communication. Be sure to read the reviews before you purchase any app. Does the iPad work for everyone? No. 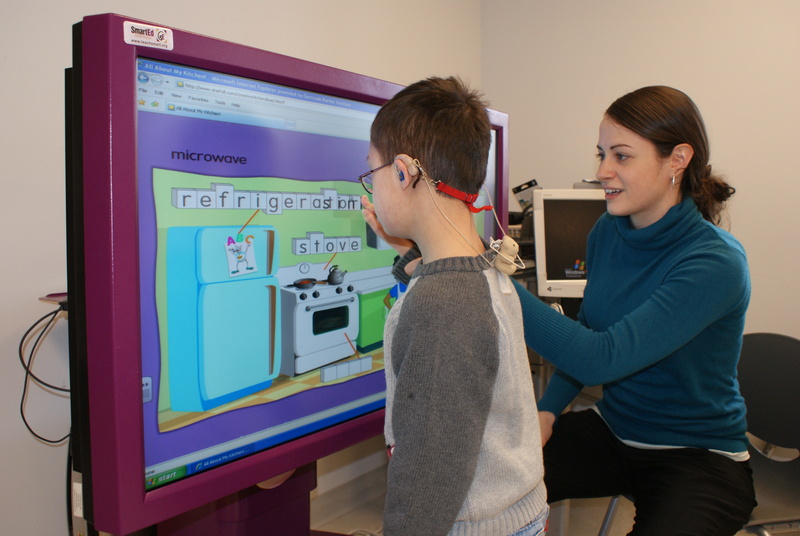 We are using a Touch Access Platform for Interactive Technology, or TAP-it, with our children who have significant physical and cognitive challenges. We describe this to our parents as a gigantic touch screen computer which can move up and down and tilt to make it more accessible for our students. Because of the size of the TAP-it, we have seen a dramatic increase in student engagement and time spent on tasks. For these children, we have found the TAP-it most successful. The iPad does work for many of our students and young adults. We began our adventure into iPads by identifying the prerequisite skills that a student would need in order to utilize this device. If a student does not have the prerequisite skills, we work on them until the student is ready for the iPad. We all know music is a huge motivator or reinforcer for many children. Recently, I read an article about students with special needs who were using their iPads as instruments. Their teacher had successfully integrated iPads into music class using Garage Band, Apple’s popular music app, along with a variety of other apps like Animoog, Midi Touch, Thumb Jam, Boom and Trope. The students were able to express themselves musically and created a digital orchestra without the arduous tasks of learning traditional instruments. I can’t wait to try this out with our students! I would love to hear your stories and experiences if you have tried this or something similar!